Dal chawal is a most favorite combo of almost every Indian. It is a comfort food for every region. Whenever we go for a trip and have lots of outside food, after coming back to home, most of us always 'Dal-Chawal' on the same day. It feels like home coming food. And it is good after lots of outside food. Because it is easy to digest and taste wise great, protein rich wholesome food. Take the toor/moong dal in a bowl, wash several times under tap water and soak for 30 minutes. Now take a pressure cooker, add the soaked dal, water, turmeric powder and salt and pressure cook for 3 to 4 whistles. Turn of the heat and keep aside to release the pressure itself. Take a pan or wok, put on gas, heat the mustard oil in it till it smokes. Temper the smokey oil with cumin seeds, whole red chili and hing, add chopped onion, ginger and garlic. Add little bit of salt & keep stirring. Remember don't add more salt as you have already added salt in dal in pressure cooker. Keep stirring the onion, garlic and ginger till the looks nicely golden in color, add tomato and keep stirring again for few minutes. Now add turmeric, red chili, cumin & coriander powder to the pan/wok. Add little bit of water to the pan/wok to prevent the masala from burning. After 1 minute add chopped spinach to the pan/wok, and mix well with the masala. Now add the boiled dal & some water to the pan/wok, let the dal boil for 5 minutes uncovered on simmer. If you cover the pan/wok, the spinach will loose it's beautiful green color. After 5 minutes, transfer the dal in a big serving and keep aside. Now take a tadka pan, heat the ghee in it. Add mustard seeds, whole red chili and kasuri methi to the ghee and fry until the seeds pop. Add the tadka on the cooked dal and serve hot with hot steamed rice. 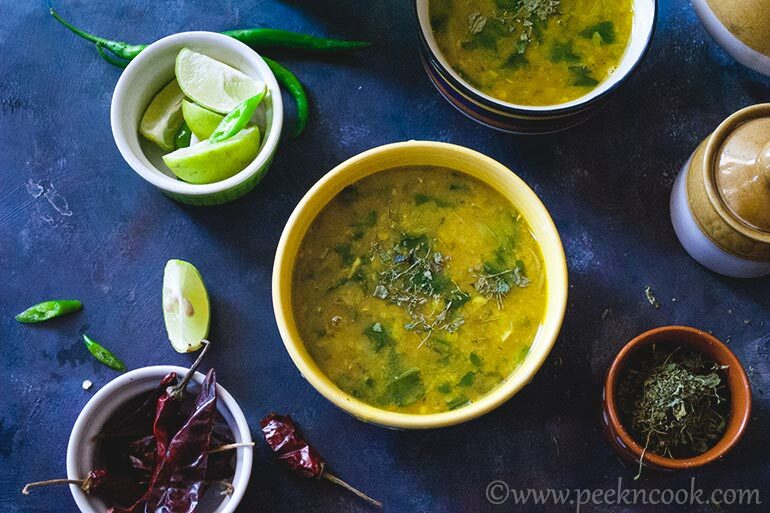 This spinach dal should be served with steamed rice, roasted papad and pickle. I don't add tomatoes, as my husband has high level of uric acid, so Dr. asked me not to give him spinach & tomato together. But the taste doesn't differ much. If you wish may add tomatoes.